When the app starts, it plays a random piece or resumes from your last selected piece. And as the music plays, the stunningly colourful music visualiser which occupies almost one-third of the screen in the centre dances along with it. 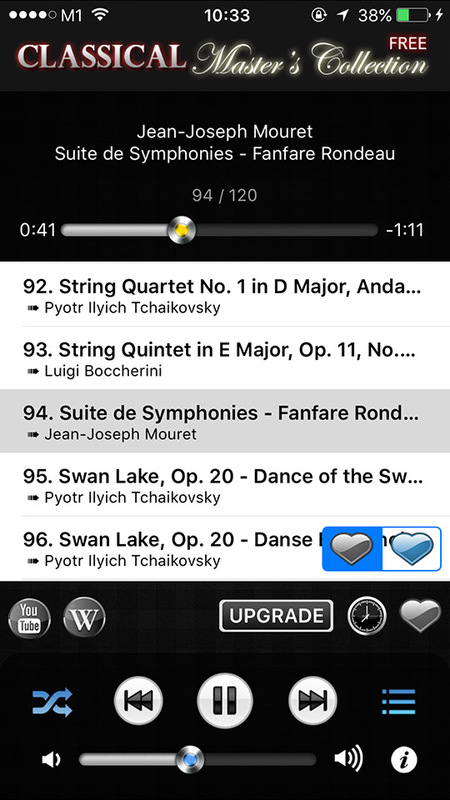 Although the music visualiser is an eye-candy, we thought the majority of the users would spend most of their time looking through the list of masterpieces, or putting the app in the background and allows the music to continue to play while you switch to other apps. 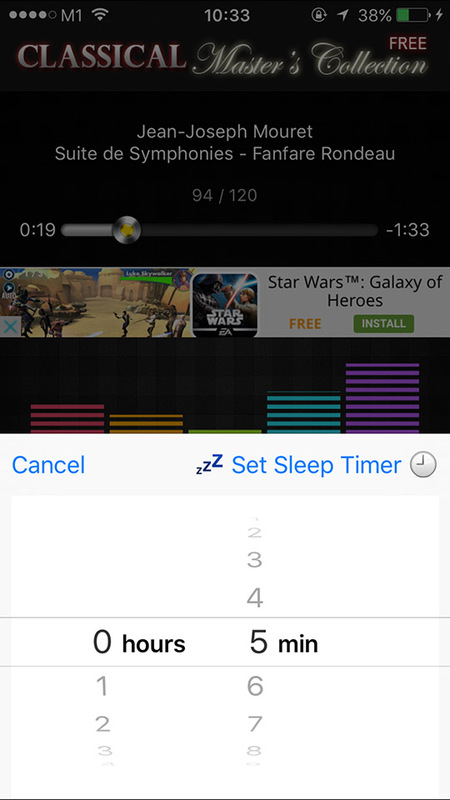 And if you want to control when the background playing should stop, you can configure the sleep timer. Otherwise, it will just keep playing. 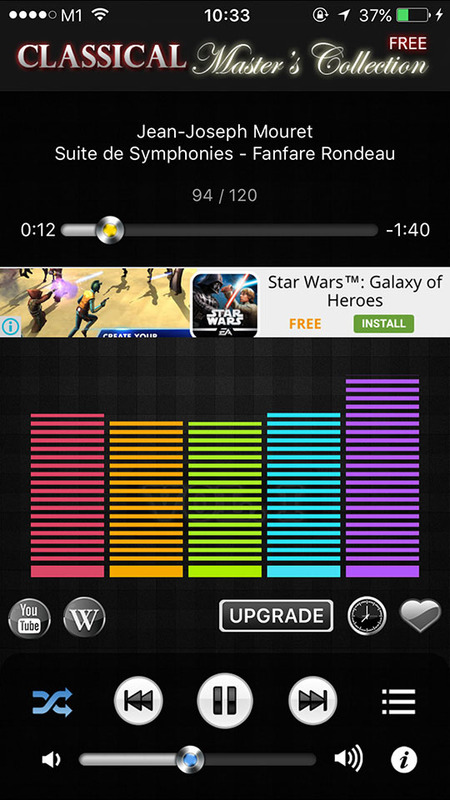 There is an annoying In-App Advertisement (IAA) just above the music visualiser. Most apps display their advertisements right at the bottom, away from the common tasks you would perform in the app. So the placement of this ad is distasteful. This app comes with 120 masterpieces when you download it. Thus, you can listen to them anywhere without an Internet connection. You can see this list when you toggle the list view on. Not only does it hide the music visualiser, it also puts the advertisement out of your view. The heart-shaped icon just beside the clock icon lets you "like" a piece, so that the piece that is currently playing is added to a favourite list. In the list mode, there are 2 heart-shaped icons at the bottom right of the list itself. One allows you to look at your favourite list, while the other switches you back to the full original list. 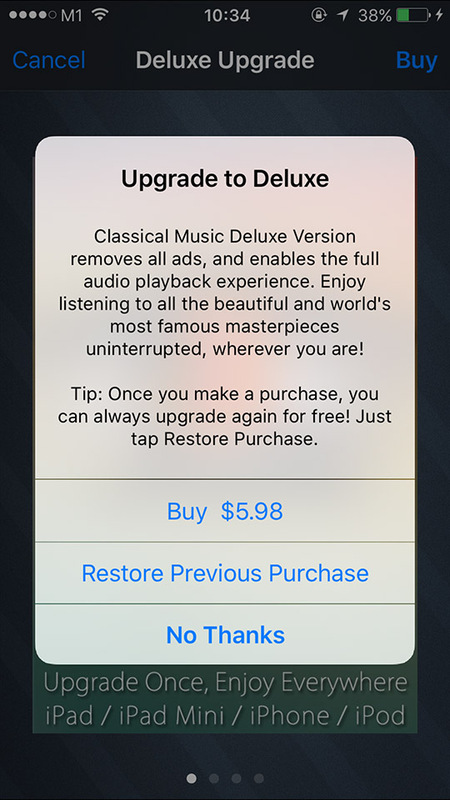 Note that free version does not allow you to hear any piece completely, and it skips to the next soundtrack after playing the current for a decent short amount of time. 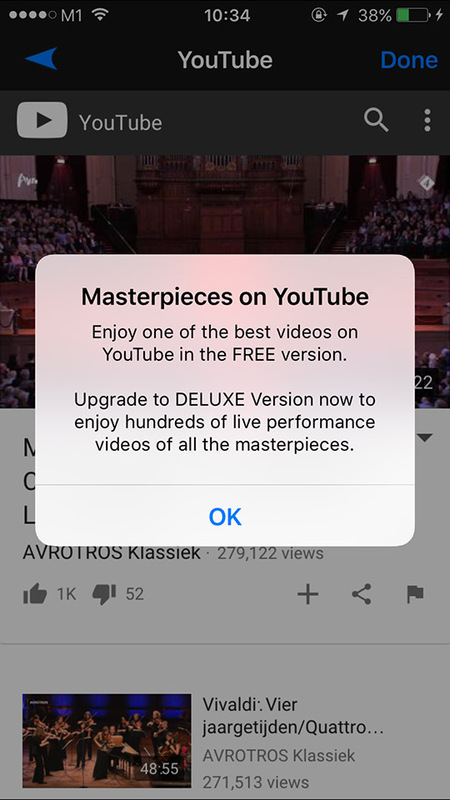 You get a message like the screenshot above informing you to upgrade to the Deluxe Version to enjoy the full length performance for an uninterrupted listening experience. 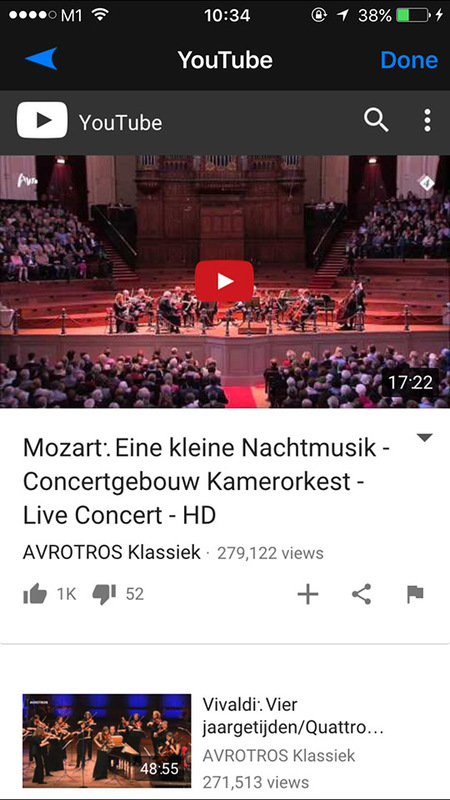 The built-in YouTube Viewer brings you live performance videos. While you can arguably search manually in YouTube's own website or app, it can be a time consuming task to find the "best" live performance videos. This app has collated them for your convenience through careful selections. This can be a great feature for those who enjoy an occasional more immersive visual experience, on top of the audio's. The free version, however, only offers one video. The Deluxe version promises you hundreds of all the masterpieces. 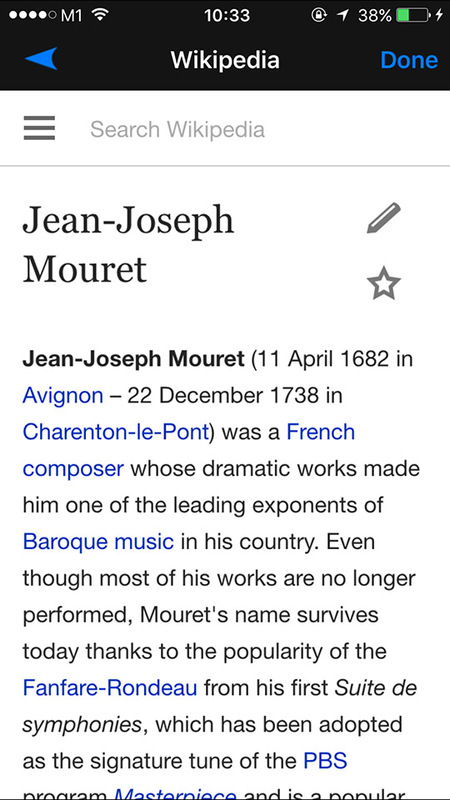 When you are listening to a piece that is currently playing, and wish to find out more about its composer, clicking the Wikipedia icon shows you the wiki page for that composer, bringing you instant biography information. The upgrade to the Deluxe Version costs SGD$5.98, which is definitely more expensive than the usual SGD$1.28 (USD$0.99). 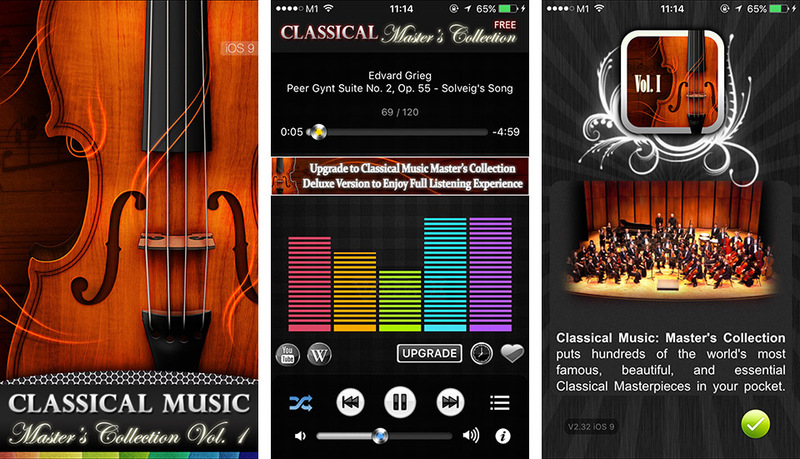 If you want to put in your phone 120 of the world's most beautiful, famous, and essential classical music masterpieces, professionally handpicked (from thousands) by music experts and performed by famous orchestras around the world; perhaps the price is justified.